Iraqi Prime Minister Haider al-Abadi sought Japan’s contribution to rebuild the country following three years of fierce fighting with the Islamic State terror group. During a multilateral meeting in Tokyo, the Shia Premier secured from his Japanese counterpart Shinzo Abe the promise of a $330 million loan earmarked for irrigation projects. 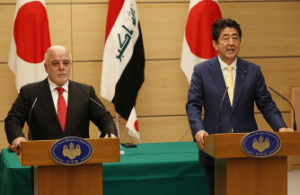 Prime Minister Shinzo Abe also announced a Japan-led international initiative to improve security in Iraq amid a proliferation of arms following the liberation of the country from the Islamic State extremist group. Abe said his country will set up a working group to help local authorities collect a number of weapons that have spread across the country, provide vocational training and create jobs for former fighters as well as local residents. Japan pledged to continue supporting Iraq and the entire Middle East for the stability of the region through its $6 billion package aid. Iraq has just emerged from a bitter battle against ISIS, which entered the country in 2014 and seized large swathes of the territory including the country’s second city Mosul. Al-Abadi declared in December victory over the radical terror group following three years of intense battles endorsed by an US-led international coalition. Participants in the multilateral meeting from around 30 countries, including the United States and Britain, and international organizations such as the World Bank, cited unemployment among youth and other vulnerable groups as a potential source of violent extremism, and said promoting a vocational training appropriate for the labor market is a challenge, the New Arab reports. Neighboring Kuwait hosted in February an international conference for Iraq’s reconstruction, during which $30 billion were pledged for the purpose.